I thought of this idea many years ago. I was preparing to make traditional beef stroganoff but the small shop I went to had no beef steaks. They did however have beef mince....ah ha! New concept! (Of course I have discovered since then other have also thought of this...and why not? 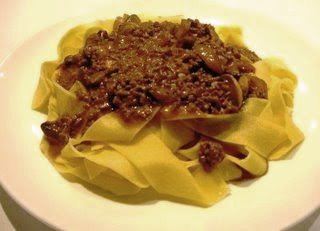 this is not your traditional stroganoff but can still be just as delicious! - Heat oil and butter in a large pot and saute onions slightly (about 4min). - Then add garlic and heat for a further 30 seconds or so (don't let the garlic get too brown). - Add beef and cook through (drain off any liquid if necessary). - Add red wine and heat through. Wait for liquid to reduce then sprinkle in half the bisto and quickly stir. Springle in the remaining bisto and quickly stir again(sprinkling and adding the bisto in smaller amounts to avoid lumping). - Pour in the stock and allow to bubble.